It is one of Britain's most intriguing archaeological finds. When two almost perfectly preserved 3000-year-old skeletons were dug up on a remote Scottish island they were the first evidence that ancient Britons preserved their dead using mummification. The scientists who uncovered the skeletons also found clues that one of them, apparently a man buried in a crouching position, was not a single individual, but had been assembled from the body parts of different people. The discovery began a 10-year investigation into what had led the Bronze Age islanders to this strange fate. Now, a study using the latest technology has found that the two skeletons together comprise the remains of at least six individuals who died several hundred years apart. The researchers believe that large extended families may have shared their homes with the mummified remains of their ancestors, before deliberately putting the bodies together to look like single corpses - possibly in an attempt to demonstrate the uniting of different families. The skeletons were unearthed in 2001 while Professor Parker Pearson was examining the remains of buildings at a site called Cladh Hallan in a sand quarry in South Uist. The site had been a Bronze Age settlement that was inhabited for well over 1000 years. While digging out the foundations of one of the houses, the archaeologists found the skeletons of an adult man and a woman they believed to be aged about 40. The skeletons appeared to be more than 3000 years old and predated the house under which they were buried by several hundred years. 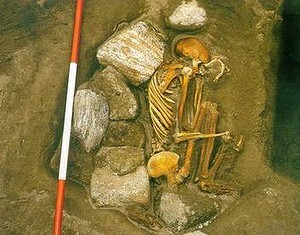 Both had been buried in a crouched position on their sides and, from the way the bones remained connected, it appeared they had been carefully preserved.